The founder, owner, and president of Hunyady Auction Company and Hunyady Appraisal Services, Mike Hunyady boasts a broad and substantial background in the auction and appraisal business. In the third decade of a career that has seen him serve the industry as a laborer, driver, equipment operator, site set-up manager, inspector, salesman, auctioneer, and appraiser, Mike has experienced the business from every angle. Through thousands of appraisals and auctions and tens of thousands of equipment inspections, he has shown the expertise and integrity upon which he has built a business that has taken him to all 50 states, Canada, Mexico, the Caribbean, South America, Europe, the Middle East, and Australia. With his purchase of Vilsmeier Auction Company, he has positioned Michael J. Hunyady, Inc., as one of the national leaders in the auction business. Mike is a Senior Member of the American Society of Appraisers and a Charter Member and former president of the Equipment Appraisers Association of North America. He sits on the board of directors of the Pennsylvania Utility Contractors Association, who honored him as its Associate Member of the Year in 1998. He also earned a similar honor from the Pennsylvania Land Improvement Contractors Association in 1986. 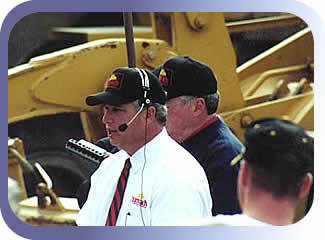 He has served as president of the Delaware Valley Associated Equipment Distributors. He has also addressed auctioneers, appraisers, contractors, equipment dealers, and financial industry representatives at local, state, and national conventions and meetings.